« Welcome Group C Arrival! With the climbing of Tateyama yesterday, Toyama Orientation 2013 has come to a close. Despite the weather, I hope everyone was able to have a memorable experience. 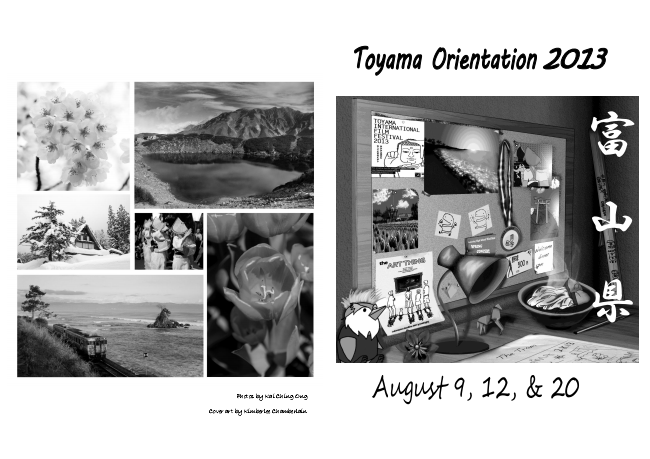 Thank you to all the Toyama Orientation Assistants for making this year’s orientation an amazing success! A special thanks to Kimberlee Chamberlain and Kai Ching Ong for designing such a spectacular cover. And of course, to Menolly Walter for creating beautiful new name tags for everyone. This entry was posted by on August 20, 2013 at 4:02 pm, and is filed under Uncategorized. Follow any responses to this post through RSS 2.0. You can leave a response or trackback from your own site.